Hale QMax-150 1500 gpm Single Stage Pump, a 1000 Gallon Poly Water Tank w/30 Gallon Foam Cell and a Elkhart #241-150 150 gpm Inline Portable Foam Eductor. 35 kW PTO generator, 6,000W light tower. 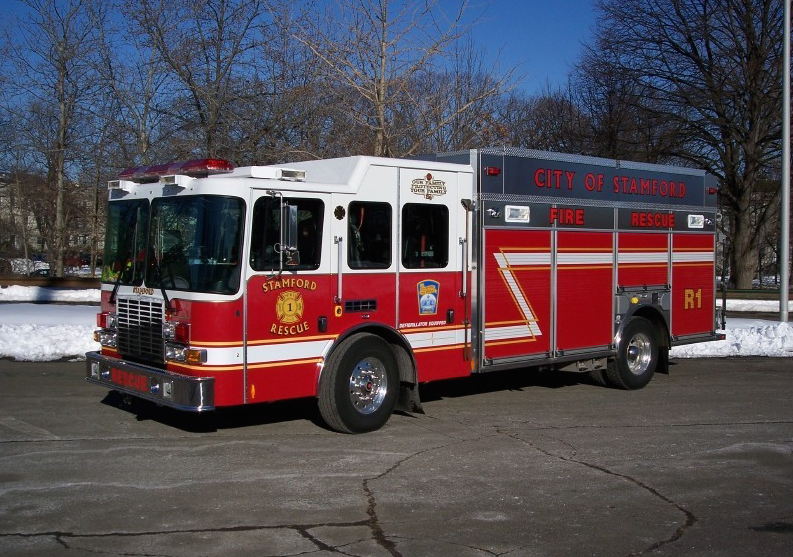 Features include a 2000 GPM, 600 gallon water tank, 30 gallon foam tank, 75′ RK Aerial, 10 kw Onan Hydraulic generator, Stainless Steel pump house, rear body, & piping. In Service as Engine 5 from Juy 21, 20014 to October 30, 2008. Refurbished in 2001 and given to PD in 2010. Acquired from the Long Ridge Fire Company. 9/26/1976: On this date #1 Truck was picked up from Middleboro Conn after having a automatic transmission installed. This machine replaced #4 Truck which was wrecked in an accident on 12/31/63. 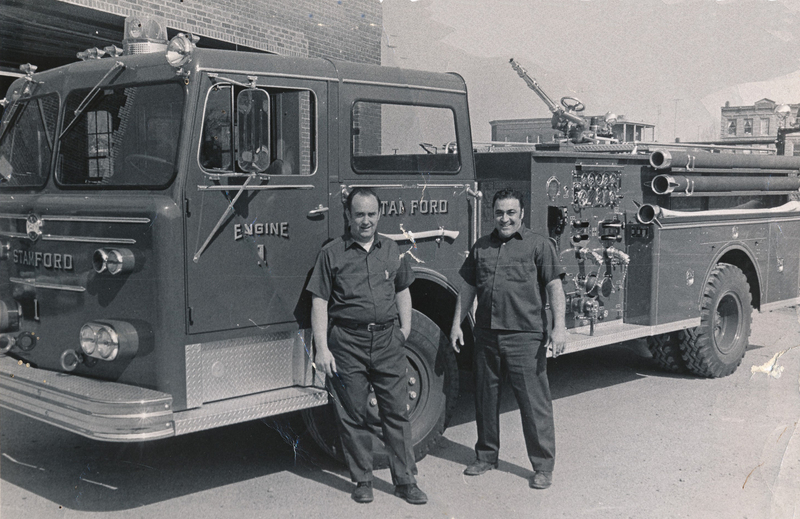 10/27/1964: #4 SNORKEL – The First Snorkel In Service In The Stamford Fire Department, Effective October 27, 1964 at 8:00 A.M. in place of #4 Truck. 10/2/1962: Replaced 1942 Mack Pumper. Arrived at Central Fire Station at 11:00 A.M. QUALIFIED DRIVERS: Albert Marsden, George Heinlein, Frank Maciolek, Julian Nosenzo, William Mocher, Italo Tamborino, Martin McNamara, Thomas Conklin, Barcaly Berg, Harry Gluz, William Densky, Jr., Thaddeus Zurkowski, Robert Davidson, Michael Coppola and James Williams. 10/19/1962: First Still Alarm for the New 750 GPM Mack. Tel. 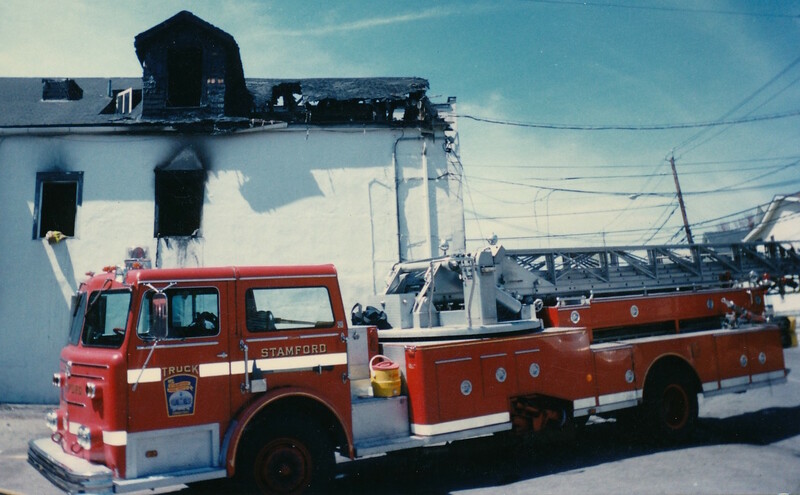 Alarm #62 Location-Rear of Stamford High School On Fri. Oct. 19, 1962 At: 6:22PM – Returned: -6:35PM Owner-City of Stamford Occpt. – Same Fire Orig. Rubbish Extended to-Same Cause-Children & Matches Ex. By-Brooms Time worked-13 min. Miles Traveled-1.5 Running Miles-7.7 Apparatus Present-$1 Mack Driver-Marsden Firemen Present-Salatino, Wood, Wetmore, Officer in Command-Lt. Bienkowski First Box Alarm for the New 750 GPM Mack. At Alarm #116 From Box #153 at 9:34 PM Recall-9:36PM Friday Oct. 19, 1962 Street-Dyke Lane Owner-Hart. Electric Light Co. Occupant-Vacant Land Fire Originated-Brush Ext. to Same. Ext. by-Water Cause-Children with Matches. Road Mileage-2.5 Running Mileage-4.7 Damage-None #1 Co. & #2 Co’s. responded to this Box. 9/21/1955: Arrived from factory at 4:24pm with company engineer Fred Haskins and R. Bartholemew sales representative. This truck officially #4 Truck.9/22/1955: #4 Maxim Aerial Ladder Truck after testing and breaking drivers went in commission at #4 Station as #4 Truck.#2 Maxim Aerial Ladder Truck which had been serving as #4 Truck out of commission at #4 Station and returned to #2 Station and put in commission as #2 Truck at #2 Station at 3:15pm. Old American LaFrance #2 Truck out of commission at 2:42pm and all equipment removed. This machine to leave Stamford. 9/19/1955: Arrived at Headquarters at about 3:00pm with Factory mechanic C. N. Gifford and Mr. R. Barthoemew, of O.B. Maxwell, sales representatives for Maxim Motors. 9/20/1955: New Maxim #2 Engine to Mill River for pumping tests with C. N. Gifford and Mechanics McAuliffe and O’Brien. This makes the second new Maxim Engine to be delivered this month. Assigned drivers from #2 Station being instructed in driving and pump operations.9/21/1955: New #2 Engine (Maxim 750 GPM Pumper) in service at #2 Station at 10:15am. 8/19/1955: New 750 G.P.M. Engine for #4 Station arrived at Headquarters at 4:30pm. This machine is to be #4 Engine. Factory mechanic C. N. Gifford and Mr. Russell Bartholemew, of O. B. Maxwell, sales representative for Maxim Motors accompanied the machine. 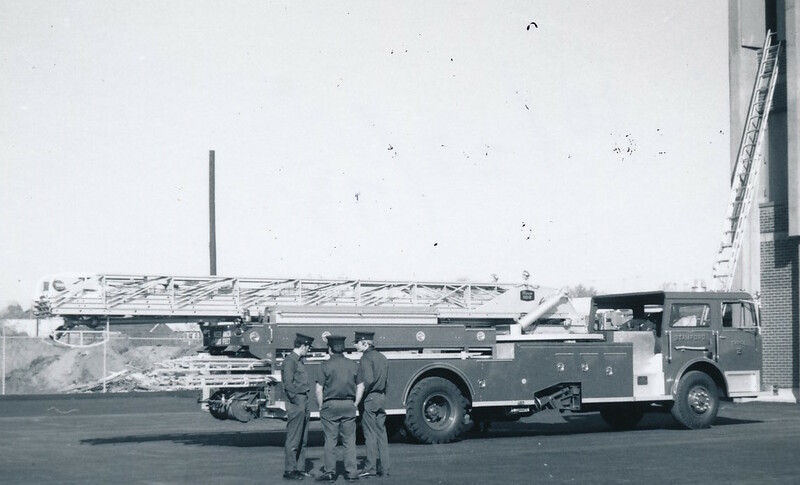 8/9/1954:New 85’ – 4 Section Aerial Ladder – Maxim – arrived. This apparatus belonged to Civil Defense, not the SFD. 3/30/1951: Aarrived from the Mack Factory, Long Island, N.Y.
4/5/1951: The City’s new 65-foot Mack Aerial Ladder Truck and 750 Gallon-per-minute Mack Pumper were officially accepted today with a picture of it and its sister Engine being taken in front of the Central Fire Station. The Pumper will be housed at the Central Station and the Truck will be housed at either #2 or #3 Station. Those shown in the picture were: Reading from left to right: Edward Spellman, District Representative of the Mack Co., Safety Board Members Paul T. Osterby, Michael J. Drotar, Mayor George T. Barrett, Safety Board Chairman Nathan E. Martin and Fire Chief Victor H. Veit. 4/13/1973: 1951 65’ Mack Ladder Truck transferred to Belltown Fire Dept. 4/5/1951: The City’s new 750 Gallon-per-minute Mack Pumper were officially accepted today with a picture of it and its sister Truck being taken in front of the Central Fire Station. The Pumper will be housed at the Central Station and the Truck will be housed at either #2 or #3 Station. Those shown in the picture were: Reading from left to right: Edward Spellman, District Representative of the Mack Co., Safety Board Members Paul T. Osterby, Michael J. Drotar, Mayor George T. Barrett, Safety Board Chairman Nathan E. Martin and Fire Chief Victor H. Veit. 4/6/1972: 1951 Mack Engine put in reserve at 4:30pm at Central Fire Headquarters. 8/26/1939: The new 85 Aerial Peter Pirsch Hook & Ladder Truck put in commission at 2:00 P.M.
8/12/1938: New 1000-Gallon Ahrens-Fox Pumper arrived at Headquarters at 10:40 A.M. it was marked for #2 Station but was too wide for the doors so it was put in commission at Headquarters at 10:52 A.M. Aug. 17, 1938. 10/18/1937: The New 600 gallon Triple Combination Engine Reg. No. l-926 arrived here and was unloaded, Underwriters Test – November 5, 1937, Purchased November 8, 1937, Put in commission at #2 Station at 3:40 P.M. November 16, 1937. 4/25/1935: The new 1250 gallon Seagrave Pumping Engine arrived here at Fire Headquarters at 1:29 P.M.
3/4/1930: Reo service car made over and put in commission as a chemical car to cover grass, chimney and automobile fires. 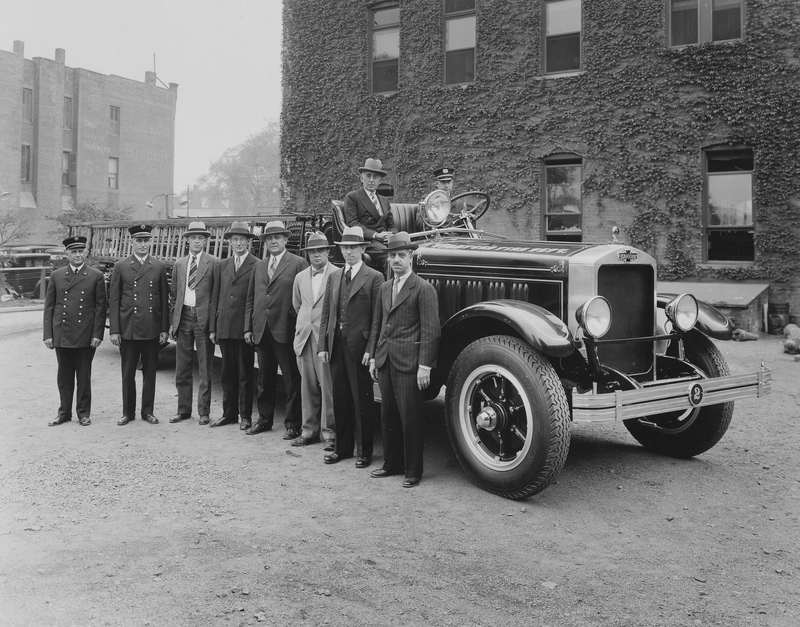 The Chief’s new Buick car was purchased and put in commission April 7, 1929. 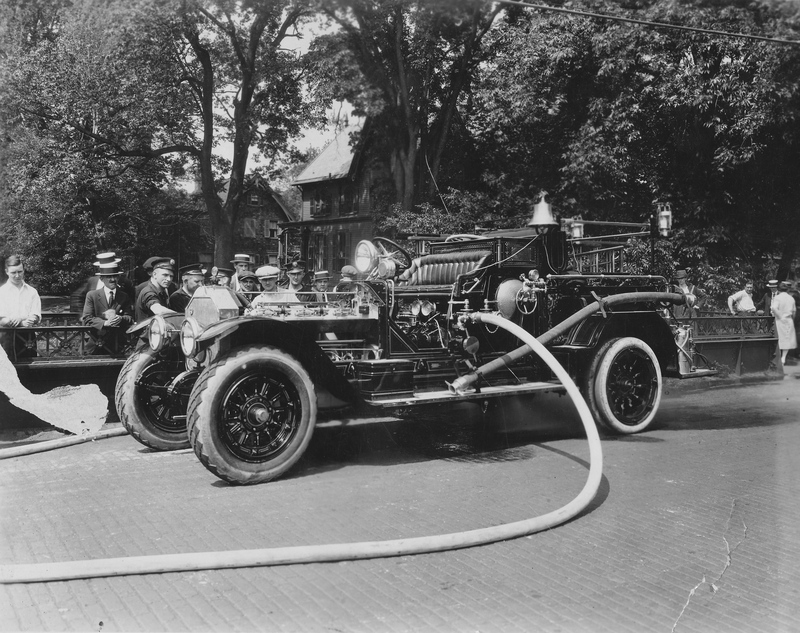 The first alarm it responded to was from Box 142 April 9, 1929 with Chief V. H. Veit, Deputy Chief L. Y. Krom, Mechanical Supervisor C. B. Krom, Electrician F. F. Veit and J. R. Murray driving. 5/22/1925: purchased (Engine No. 2 Chemical). 11/10/1955: Old #1 Chem. & Hose Wagon (American LaFrance 1925) out of Comm 2:1xpm. 2/7/1956: Old # Chemical and hose wagon (American LaFrance, 1925) sold to Rubino Bros. Inc., 560 Canal St., Stamford, Ct. on bid for $125.00. 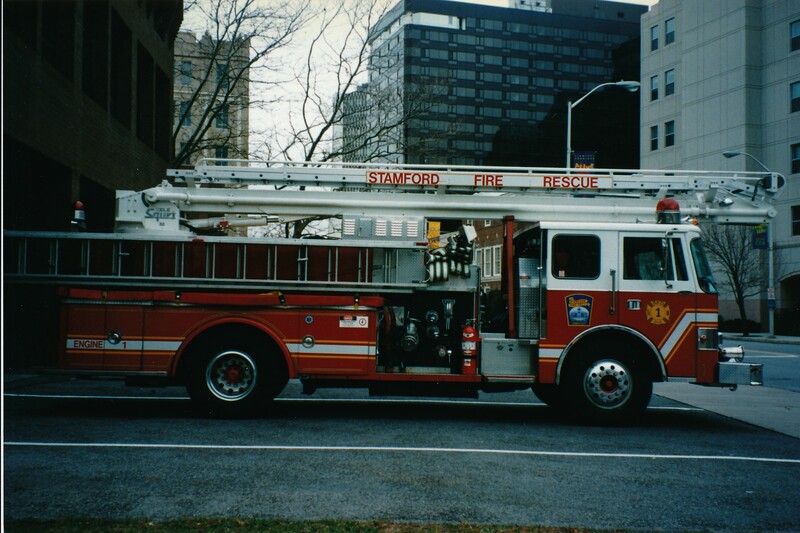 This machine was purchased May 22, 1925 for the City of Stamford and saw many years of active service in this department. This apparatus left fire headquarters at 3:15pm driven by Mech. McAuliffe and was delivered to RUbino’s Junk Yard. 6/12/1922: Purchased (Engine No. 4). Pictured on Broad Street in 19226/21/1924: Engine No. 4, an American-LaFrance, was wrecked. It skidded off the road while responding to a fire at Stamford Hall above Bull’s Head. 4/11/1941: #4 Engine — American LaFrance Triple Combination – purchased June 12, 1922 — Broke down August 30, 1948 – Mechanics started to dismantle this entire machine at #3 Station on April 11, 1949. Equipment and parts usable by Chief to be stored away for the future. Tires and tubes turned over to Mr. Case of the Service Dept. on Nov. 8, 1949. 7/25/1921: Chief’s Cadillac Car purchased. 5/9/1916: American LaFrance Combination Hose and Pumper purchased (Engine No. 1). 5/21/1915: Ladder TruckNo. 1 purchased. 5/31/1916: American LaFrance motor City Service Truck with chemical equipment purchased (Truck No. 2). 9/23/1955: American LaFrance City Service Truck, known as #2 Truck left Fire Headquarters at _______ with _______ driving going to Manchester, Conn. to be scrapped. 8/19/1913: purchased (Engine No. 3). 11/25/1913: Chief’s Automobile purchased. (Pope Hartford). 12/2/1911: First motor drive purchased ( Engine No. 2). 10/3/1906: Amoskeag Steam Fired Engine purchased. 5/1/1905: First Chemical Apparatus purchased. 1/28/1930: Old Locomobile Chemical discarded (First motor piece of fire apparatus purchased). 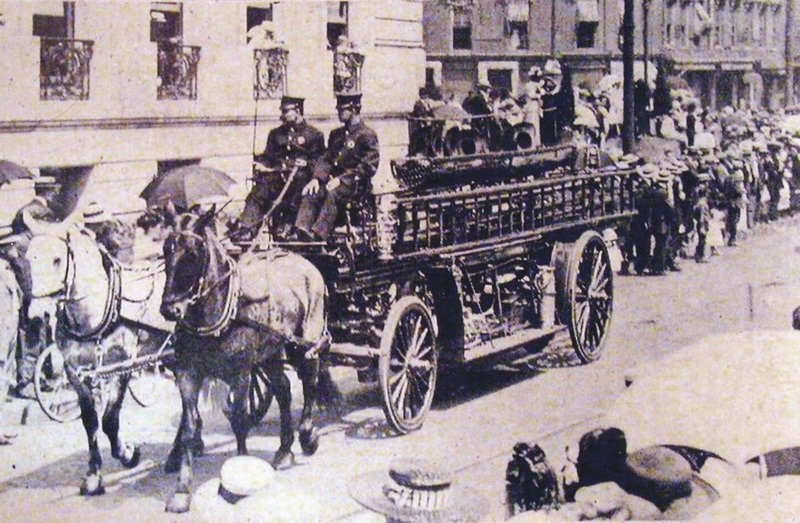 9/1892: American LaFrance Steam Fire Engine purchased. 1889 Horse Drawn Aerial Ladder Truck10/1889: First Aerial Ladder Truck purchased. 3/1/1916: Old horse drawn Aerial Truck No. 1 sold. 11/18/1857: On Nov. 18 and Dec. 2 1857, No. 2 Engine Co. held meetings to discuss purchase of a larger engine. The Jeffers company in Pawtucket, RI offered one for $1700 with a $200 trade-in of the Hunneman. After much comparison, a 10″ Button engine was decided on, an improved version of the “Rippowam” in town. Per Dunshee, it may have been an end-stroke engine, Hunneman’s specialty. 12/1/1854: In December, 1844, “Rippowam Fire Engine Company No. 1” having been formed with Sands Seely as foreman, the new engine was placed in its charge. The cost of this machine was $500, and the committee – James B. Scofield, Edwin Bishop and Enos B. Waterbury — also purchased 197 ft. of hose for $118.20. According to H. H. Easterbrook*, a fire historian, this engine was a “goose-neck” model, hand-drawn, hand-pumped. The new fire company soon petitioned the State for a Charter which was granted in the 1845 Session.*H. 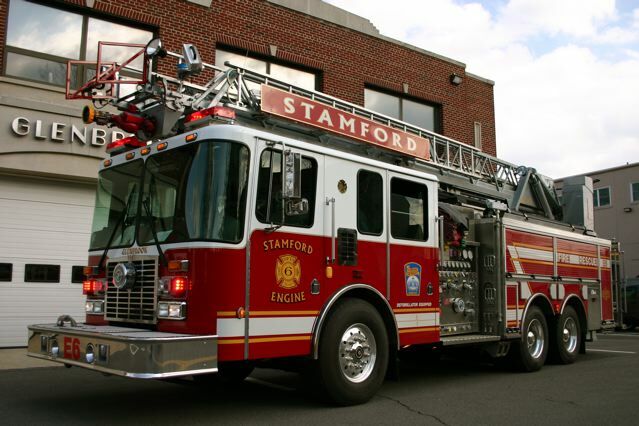 H. Easterbrook wrote a letter on June 9, 1911 to H. W. Parker, Chief of the Stamford Fire Department in which he gave many details of the early Stamford fire engines. This letter was published in the Stamford Advocate June 24, 1911 and also quoted in Sherwood. The original is at the Fire Department. A photo in the Advocate’s Tercentenary (1941) shows it in front of the South End firehouse, titled: “…a hand-drawn pumping engine used by volunteer firemen in 1844 and for 12 years thereafter.” A zipatone drawing in the vertical file is merely tracing of this engraving.